The third and fourth issues of Crimespree Magazine are bundled together for the first time as an eBook for all you collectors. 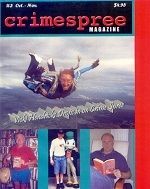 These issues featured an article from Vicki Hendricks about skydiving and a roundup of 2004. 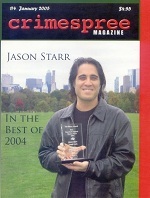 These issues were originally published in Oct-04/Nov-04 and Dec-04/Jan-05. Short stories are supplied by Michael A. Black, Zane Radcliffe, Sarah Weinman, Steve Torres, Rick Mofina and Jon Jordan.